A deep, rich, and wonderfully written RPG that lives up to the towering legacy of the games that inspired it. Almost an hour had passed, and I was still on the character creation screen. That’s how I knew, before I’d even started, that this homage to classic computer role-playing games like Baldur’s Gate, Icewind Dale, and Planescape: Torment was authentic. Created with the help of 77,000 Kickstarter backers, Pillars of Eternity is Obsidian’s love letter to those beloved Infinity Engine RPGs that have come to represent the best of the genre. But while it could easily have been little more than a cynical nostalgia trip, dining out on the legacy of those old games, Obsidian have actually created something that stands tall on its own. It’s the most captivating, rewarding RPG I’ve played on a PC in years, and I’ve fallen in love with the intricate, richly painted world they’ve crafted. You begin by creating a character. Most of the races are familiar—elves, dwarves, humans—but there are a few you won’t have seen before. The aumaua are giant semi-aquatic humanoids with colourful patterned skin. Orlans are diminutive, furry creatures with large ears. Godlike are blessed by the deities they worship, giving them a distinctly supernatural appearance. The influence of D&D is clear throughout Pillars of Eternity, but Obsidian have taken many of its staples and twisted them to fit their own lore. The same applies to the game’s eleven playable classes. There’s the usual selection of wizards, rangers, fighters, barbarians, and so on, but there are two wild cards in the deck: the cipher and the chanter. Ciphers have extraordinary mental abilities, sucking energy from the souls of their enemies and using it to cast powerful spells. They can force an opponent to relive the pain of an attack over and over again, or confuse them by making them think they’re surrounded by ghostly apparitions. Chanters are a bard-like class whose songs and stories awaken lost souls around them, creating magical effects. Their chants can summon skeletons to aid them in battle, create thunderous explosions that push groups of enemies back, or paralyse foes with fear. One of the ways Pillars plays with D&D standards is allowing magic users to hold their own in regular combat. A chanter can comfortably wear plate armour and wield a two-handed sword, meaning your party doesn’t have to be burdened by squishy mages who explode into a fountain of gibs when an ogre so much as looks at them. I don’t know how long I spent creating my character in the end, but it was a long time. I settled for an elven ranger, choosing a white wolf as my pet. As well as your main race, you also get to select a sub-race. I go for a Glamfellen, or pale elf as they’re more commonly known, from a chilly expanse of ice and snow to the far south of Pillars’ world, Eora. These tall, pallid elves are rarely seen in the Dyrwood—the lush forested region where the game is set—so I thought that might get some interesting reactions from the locals. They’re also naturally resilient against fire and ice damage. People you meet will react to your race, class, and background, both positively and negatively, so the choices you make when you create your character have some meaning beyond personal preference and what you want your hero to look like. The Dyrwood is fairly multicultural, and I’m glad Obsidian didn’t go down the road of making racism a big part of their world, which is a fantasy trope we've seen before in modern RPGs. There is, naturally, some animosity between certain races and factions, but it’s rarely at the forefront. Instead, the cultural tension comes from a controversial science called animancy, which involves the manipulation of souls. When your hero arrives in the Dyrwood, a mysterious curse called Waidwen’s Legacy is causing babies to be born without souls, which becomes an important part of the main quest. Animancers are convinced their work will put an end to the curse, but others think it’s an affront to the gods. This mirrors the battle between science and religion throughout our own history, although animancers do a lot worse than tell people the world is round and clone farm animals. They implant animal souls into children, power automated war machines with them, and perform all manner of bizarre, ungodly experiments that, understandably, have given them a bad reputation. After surviving a deadly magical storm known as a bîaŵac, your hero’s own soul is ‘awakened’, turning them into a Watcher: a person who can use souls to see people's’ past lives. A useful power you might think, but an encounter with an old Watcher who has been driven mad by it sends your hero on a quest to discover who or what caused their awakening, in order to reverse the damage. However, this being an RPG, it’s not long before their fate becomes entwined in that of the Dyrwood itself. Waidwen’s Legacy, it seems, may be connected to your own predicament. The story in Pillars of Eternity is told largely through text. Page upon page of superbly written, vivid, descriptive text. There’s some voice acting, from companions and in important story quests, but mostly you have to use your imagination. This frees Obsidian to write mountains of text without having to worry about recording dialogue for it all, and the result is a vast amount of detail. As characters speak, their body language is described, giving you a sense of their personality. Click a magnifying glass icon on certain objects in the world and you’re treated to a totally unnecessary, but wonderfully evocative, description of them. Use your Watcher powers on selected NPC’s souls and you’re treated to expressive 500-word vignettes about their past. I haven’t done this much reading, and enjoyed it, in a game since Planescape: Torment. Dialogue is also at the heart of the role-playing. There are dozens of factors that can come into play when you’re speaking to someone, from your race and reputation in a town, to your alignment with certain groups and your base stats. To give an example, a quest in the city of Defiance Bay sees a kid asking you to buy a knife for him, in exchange for the location of a secret. If your might stat is above 12, you can grab him by the shirt, hold him above your head, and demand he tell you where the secret is. This lowers your reputation in the city and gives you an ‘aggressive’ point. Get enough of those and people will react appropriately. A city official might shun you because of your bad attitude, but a shady character down by the docks will see it as a positive trait. This is called your disposition, and there are loads of ways to shape it: benevolent, cruel, clever, stoic, rational, deceptive, honest, passionate, clever. The more you act a certain way, the more your reputation will grow around it. This gives you fine control of your character’s personality, which enhances the role-playing side of things significantly. It also lets you, in true classic RPG style, talk your way out of tense situations, using your intellect or charm to defuse them. Violence isn’t always the answer in Pillars of Eternity. But sometimes it’s unavoidable, so it’s a good thing the combat is excellent too. If you’ve never played an Infinity Engine game before, think of the combat as like a real-time strategy game, but with the ability to pause at any time and plan your next move. Depending on who’s in your party and the skills they have, battles can play out in a multitude of different ways. Even on normal the game presents a stiff challenge, and in tougher battles you really do have to play with a strategy in mind. The rhythm and style of a battle is also determined by the enemies you face. Fighting a pack of wolves is very different from fighting a team of skilled spellcasters. You have to make good use of buffs, debuffs, offensive and defensive magic, and the unique abilities of your classes. Pausing before you make a move, studying the battlefield and your available powers, quickly becomes a vital habit. Here’s how a typical battle with my current party might play out. But there are so many ways to play that this is just one of countless strategies. Leading the charge is Edér, my fighter. He’s clad in thick plate armour and is equipped with endurance-regenerating gear, making him a formidable tank. In most fights his HP rises faster than it falls. He can knock enemies over and sap their health by poisoning his blade. Alongside him is a cipher, Grieving Mother, who is, incidentally, the game’s strangest companion—and written by Torment scribe Chris Avellone. Equipped with a dagger, she slashes away at enemies, sucking energy from their souls. This energy, called focus, is then used to cast spells that can immobilise, damage, and confuse her opponents. Behind them are two rangers, Sagani and my own elven Watcher. Both have wolves as pets, and they join Edér and Grieving Mother at the front, drawing aggro and letting us safely pepper the enemy with arrows from afar. As well as powerful ranged attacks, I can hobble enemies and damage them over time. Pets grant damage and defence bonuses to rangers, but if they die, their stats will actually decrease for the duration of the battle. Your choice of pet is important too. Wolves are fast but relatively weak, bears have a massive damage threshold, boars get a might bonus when their stamina is low, and lions can terrify enemies with a mighty roar. Finally, at the back, there’s my two casters, Aloth and Durance. Aloth’s a wizard, and one of the biggest damage dealers in my party. He casts magic missiles that bounce between enemies, creates copies of himself, launches devastating AOE fireballs into groups, and zaps them with bolts of electricity. The wizard is one of the most fun classes to play in Pillars, and some of the later level spells create dazzling light shows. Wizards’ spells are stored in a grimoire, and you can actually pry the grimoires from the fingers of any wizards you kill to gain access to their spells. But the secret hero of the party is the priest, Durance. While everything’s kicking off at the front, he hangs at the rear of the group casting healing and defensive spells that quietly keep everyone alive and boost their stats. He casts bubbles of healing energy, improves accuracy, and strengthens armour. When your party is working together like this, the combat comes into its own. Or, if you want a real challenge, you can play the game solo. There’s even a permadeath option for the masochists among you. Companions were a huge part of what made those Infinity Engine games so memorable, and Pillars features a similarly varied cast of intriguing, colourful weirdos to adventure with. Durance is a priest who has been betrayed by his own god. Pallegina is a godlike paladin who has sprouted birdlike feathers. Kana Rua is a seven-foot-tall scholar who wields a two-handed sword. They all have their own reasons for being in the Dyrwood, which you can get involved in, and they’ll regularly comment on your decisions and actions. These relationships develop as major events in the story occur, and you’ll either grow to love or hate the people you’ve chosen to travel with. You can create your own party members at an inn, but you’ll miss out on a lot of story. Surviving a tough battle through clever use of your party’s distinct skills is immensely satisfying. Controversially, though, you don’t earn any XP for killing things—only through quests, discovering locations, and actions like disarming traps. It's already dividing the community, but I think it's a bold, brilliant idea. Characters who choose to sneak or talk their way through quests are rewarded equally with those who resort to violence. 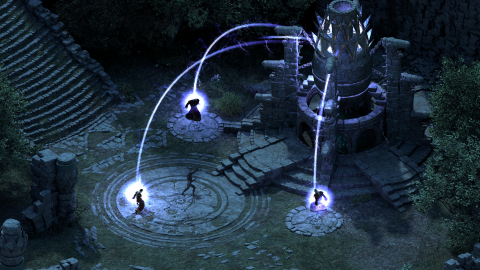 Pillars of Eternity is an RPG that really makes you feel like you’re on an adventure. Plunging the depths of ancient ruins, battling the monstrous creatures who lurk there, grabbing the loot, then limping back to the warm glow of an inn’s hearth to rest and steel yourself for the next quest. It’s a testament the quality of the art, atmosphere, and writing that, despite the old school 2D visuals and isometric perspective, I’m completely transported to its world when I play it. And it’s big. Like, really big. It took me 11 hours to reach Defiance Bay, the first of the game’s two capital cities. There are multi-path, open-ended quests everywhere, and your journal will fill up rapidly as you explore. It was another 30 hours before I reached the second city, Twin Elms, and there are dozens of towns, temples, ruins, and wilderness sections to explore on the way. There’s a critical path to follow, which leads you naturally across the world map, but you can ignore it and explore at your own pace. You become the lord of a stronghold early on, opening up an elaborate management side-game in which you upgrade its defences, deal with bandit attacks, and send party members out on quests. And below your stronghold you’ll find the Endless Paths of Od Nua, a gargantuan 15-level mega-dungeon that’s home to some of the toughest battles and best loot in the game, with a big surprise at the end. This is a big, fat, deep adventure that lets you carve your own unique path through a fantasy world that’s been brilliantly brought to life with rich, evocative writing. It’s a game steeped in a bygone era of computer RPG design, but somehow it doesn’t feel archaic. Obsidian have always been bound to other peoples’ worlds—Fallout, Dungeons & Dragons, Star Wars, South Park—but in creating their own from scratch, they’ve made not only their best game to date, but one of the best RPGs on PC.